The folder that Engage creates to contain your published output. For example, if the Title field contains the words MSDS Interaction, Engage creates a new folder on your hard drive called MSDS Interaction—Engage output when you publish. In the Description field, you can enter some descriptive text about your interaction if you'd like. Depending on your LMS, this descriptive text may appear along with the interaction name in certain screens within your LMS environment. In the Folder field, indicate the place on your computer where you want Engage to create your published output. Click the ellipsis button (...) to browse to a specific location. Engage will create a new folder in that spot with all the files needed to play your interaction. Important! Always publish to your local hard drive. Publishing to a network drive or a USB drive can create problems with your published output. After you publish your interaction to a local folder, upload the output to your LMS to test it. If learners use the Articulate Mobile Player, you can add more information by clicking the ellipsis button (...) next to the Title field on the Publish window. The following Project Info window appears. The thumbnail below the Title field is what will appear for this interaction when learners browse content in their mobile player library. By default, Engage uses an image representing the type of interaction you built, but you can use a different image for the thumbnail. Simply click the blue text below the image. Then click Picture from File and choose an image. The Identifier field is a unique string of characters assigned by Engage. Your LMS uses it to identify your content. If you're republishing an interaction that's already in your LMS, don't change the value in this field. If your LMS doesn't yet support the Tin Can API and you need to track and report on learners’ results, don't include the Articulate Mobile Player option when publishing (see the next section for details). Learners will need to view your interaction in a browser that supports Flash or HTML5, so that the interaction can communicate results to your LMS. If your LMS doesn’t support the Tin Can API but you don’t need tracking, you might still be able to deploy your Engage content via your LMS for viewing on the Articulate Mobile Player. However, not all LMSs allow content to be viewed on a mobile app, so you’ll need to test this with your own LMS to confirm. Allow downloading for offline viewing: This option lets learners download your content to their Articulate Mobile Player app, so they can view it offline later. However, offline viewing isn't currently supported for LMS content. An internet connection is required to view track content in an LMS. The Properties section of the Publish window allows you to make any last-minute changes to your interaction player or the compression settings Engage uses when publishing. The Quality field allows you to control the compression settings Engage uses for audio, video, and pictures you've added to your interaction. The settings here default to whatever you used the last time you published an Engage project. To change the quality settings, click the blue text and change any of the fields as noted below, then click OK. Choose Custom if you want to define your own quality settings. Then click and drag the slider on any of the three values to change the compression. Using higher values means higher-quality output but also larger file sizes (which means longer download times). 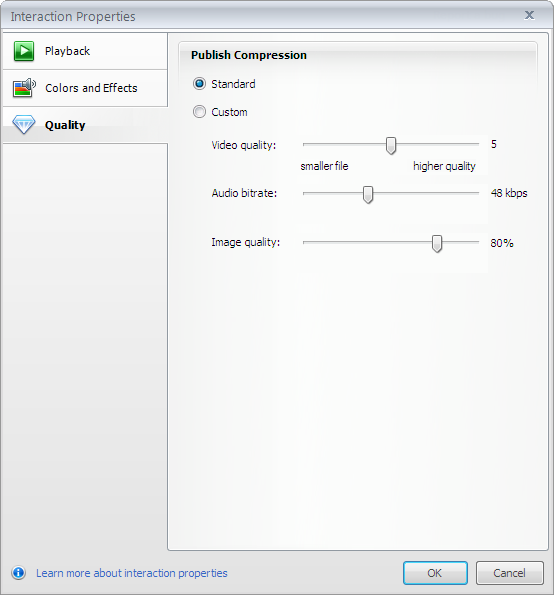 Lower values mean smaller file sizes and faster download times, but the visual and audio quality will be lower. In the Properties section of the Publish window, click the Tracking field to open the following window, where you can choose options for the way your LMS tracks and reports learners' progress. Use the LMS selector to choose the standard to which you'd like to publish (ask your LMS administrator if you're not sure). 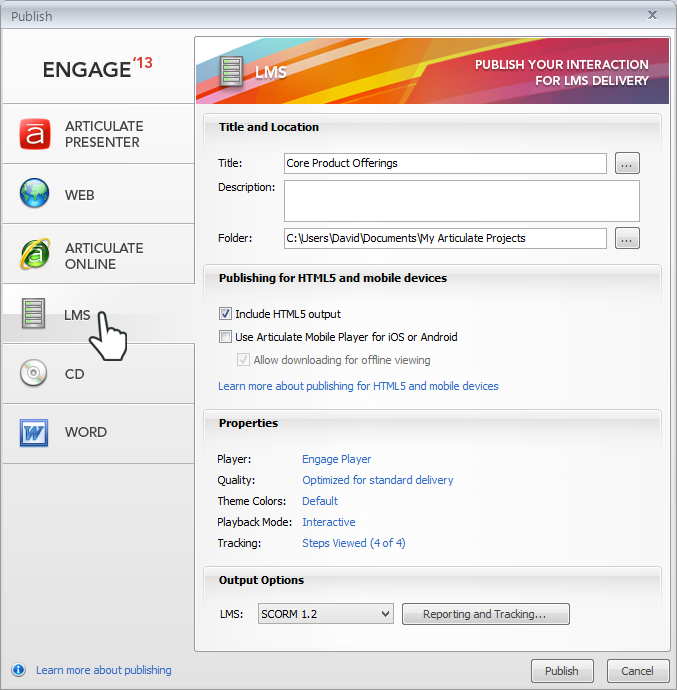 Engage supports Tin Can API, SCORM 2004, SCORM 1.2, and AICC. If you've chosen Tin Can API as your reporting specification, you'll see a field called Launch URL. Use this to enter the full URL of the interaction.html file if you plan to host the content on a server that's separate from your LMS. Typically, you'd host your content on a server separate from your LMS if your LMS supports the Tin Can API but hasn't yet allowed private content authorization for mobile apps. Find out more here and here. The Identifier field is a unique string of characters assigned by Engage, and your LMS uses it to identify your content. If you're republishing an interaction that's already in your LMS, be sure not to change the value in this field. 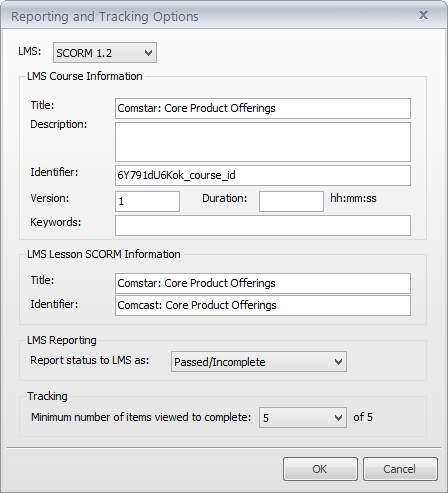 If the window includes a section called LMS Reporting, use the selector to choose the wording you'd like to use when expressing learners' status with regard to this interaction. In the Tracking section at the bottom of the window, select the minimum number of steps learners must view in order to register course completion in your LMS. When you're finished choosing your options on the Publish window, click the Publish button. 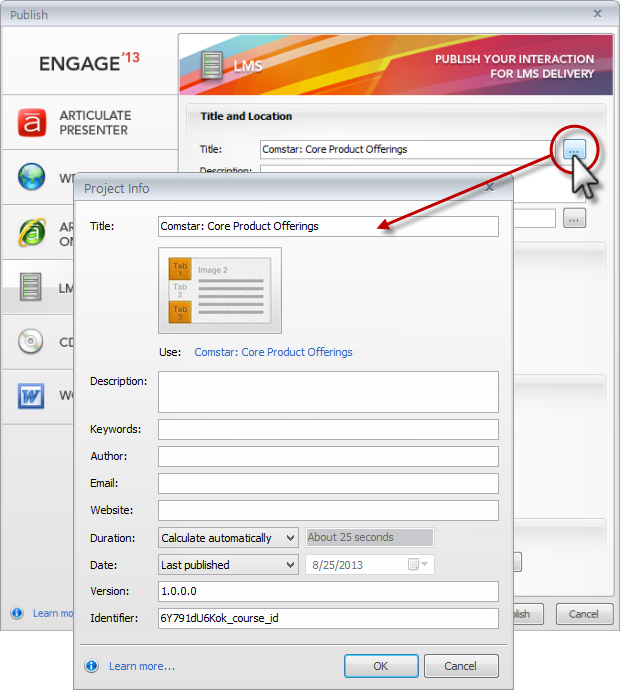 Engage creates your published output in the location you specified. 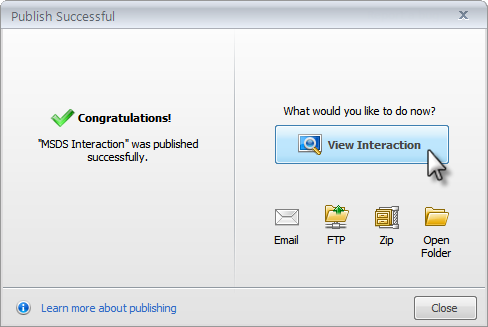 When publishing is complete, you'll see the following Publish Successful dialog. View Interaction: This launches your interaction in your web browser so you can take a look at your output. If you want to test your published interaction, it's best not to do it this way. Since your published output was created specifically for use with an LMS, you should instead upload the published output to your LMS, and test it from there to make sure it behaves as expected in the environment where you plan to use it. Email: This opens up a new email message with a zipped file of your published output attached. This might be helpful if your LMS administrator will upload the published output for you, and you need to send him the published output for upload. FTP: This opens a window where you can enter your FTP credentials and transfer the published output to a website (which isn't something you'd typically do if you've published for LMS). ZIP: This creates a zipped file of the published output in the location you specified on the Publish window. For LMS users, this is the most common choice. Then you can easily upload your entire zipped interaction to your LMS. Open Folder: This opens a file viewer where you can see the files Engage just created. There will be several folders and files which are needed to play your interaction. If your LMS requires that you identify a single launch file once you've uploaded your content, the file to point to is index_lms.html for SCORM/AICC content or interaction.html for Tin Can API content. Now that you've published, it's time to upload the interaction to your LMS. The steps for this are slightly different for each LMS. Ask your LMS administrator if you need help uploading, launching, or tracking content. When learners launch your interaction, they'll see the right type of content based on the device and browser they're using.